12v, 24v, 48v DC portable 500w pure sine wave power inverter with USB outlet for your laptops, cellphones and other home devices. Tips: Can I connect this 500w pure sine wave inverter to an adapter? Adapter has to be rated for the current required by the pure sine wave inverter, its response to load steps should be quick to avoid battery low or battery high error detection by the power inverter, it should be capable of handling the large 2nd harmonic component demanded by the pure sine wave inverter. During mains presence inverter will charge batteries. If adapter is connected then power inverter will try to force the current into the adapter. 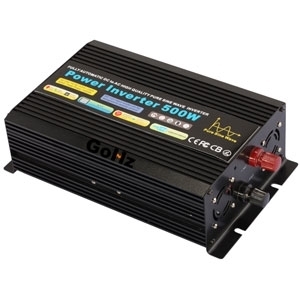 The adapter needs to have blocking feature or you should take care of not connecting mains to this 500 watt sine wave power inverter. If all the above conditions are satisfied you can connect a pure sine wave inverter to an adapter.